Tableau Software (NYSE: DATA) had reported a good increase in revenues for Quarter and nine months for the Fiscal Year 2018. The company reported revenue of $138.1 million, approximately a 40% increase year on year (YOY) in the Business Analytics Software License segment for the third quarter. Meanwhile the Revenue from the Maintenance and Services segment was reported as $152.5 million, up by approximately 32% YOY. The revenue of the company has been growing at a good pace and beating consensus estimates. 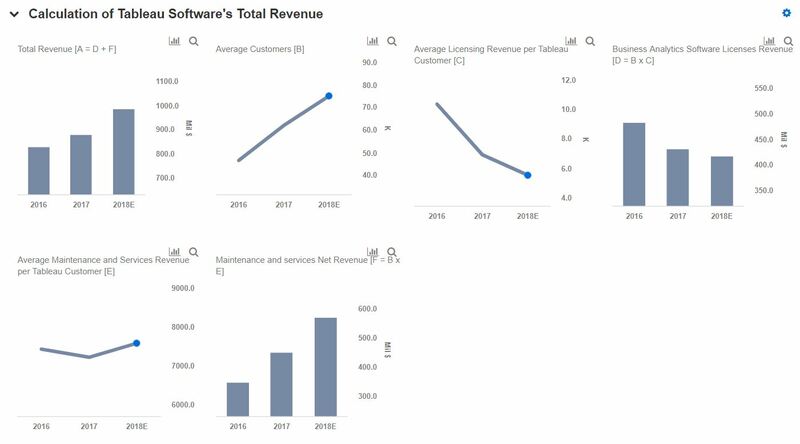 We have created an interactive dashboard on What Is Tableau Software’s Revenue Breakdown?, which details our forecasts for the company in the near term. You can modify our assumptions to see the impact any changes would have on the company’s revenue. We expect Tableau Software to generate an overall revenue of approximately $985 million with the Business Analytics and Software License segment contributing about $416 million and Maintenance and services segment contributing about $569 million. The Final results of the company are a couple of weeks away and will be released on 6th February, 2019 with consensus expectations of a growth in Total revenue above 10% YOY.